This is the opinion of Slavi Angelov, top investigative journalist from the 24 Chasa Daily, who is known for his investigations of the Bulgarian mafia, and is the author of several best-selling books about it. Angelov points out that in general, the Bulgarian “organized crime” – which has become something of a catch phrase for Bulgaria in the European media – i.e. groups of that kind are not really strong outside the country – unlike mafias from the former Yugoslav republics, for example, who have much longer histories and whose members had the opportunity to travel to the West long before 1989 (when the Bulgarians got it). There seems to be little presence of Bulgarian organized crime groups in the Netherlands – except for the general international criminal contacts which appear to be somewhat of a given in that kind of activity. Yet, when thinking of organized crime in Bulgaria, one cannot skip the fact that two of the most famous Bulgarian mafia bosses were murdered abroad. The murders, of course, were plotted by their enemies back home. And what is interesting is that both of those murders took place on Dutch soil. “Had he not made such a bad mistake so early, today Poli Pantev would have been a real monster because of his strong character and abilities,” Angelov told Novinite.com in an interview (to be released). At the beginning of the 1990s Poli Pantev was already one of the “senior officers” of the first really powerful organized crime group VIS, headed by former wrestler Vasil Iliev. When VIS – which was basically a security – read: “racketeering” - company – was pressured by the authorities – it was transformed into “VIS-2” – an insurance – again read: “racketeering” (and much more than that, of course) - company. This formal switching from security to insurance is rumored to have been the brainchild of Poli Pantev. Even before the murder of its boss Vasil Iliev in 1995, some of the top leaders of VIS broke up from it, and went on to found its major competitor – SIC. Poli Pantev switched to SIC in the mid-1990s becoming a top “executive” of the organization. However, he is generally believed to have been more of an independent boss, setting up his own businesses, though often in partnership with other SIC bosses. Never having been a “godfather”, i.e. the very top boss of the Bulgarian mafia, Poli Pantev is known for being extremely shrewd, impertinent, and brutal. By the late 1990s, his power was growing, and he was gaining very strong positions in a number of spheres. A known “trivia” fact is that he was the first Bulgarian gangster to buy a Thai prostitute all the way from Thailand who is known to have quickly become very popular. In 1997, he took over most of the drug market in Sofia. Shortly after that, he and the drugs “executive” of VIS, Metodi Metodiev, known as Meto Ilienski, hammed out a deal splitting the Sofia drug market 50:50, and even held weekly meetings in order to keep the peace between the dealers controlled by each of them. In 1999, Poli Pantev sent his men to try to steal 600 kg of cocaine from a storehouse in Southwestern Bulgaria. The cocaine had recently arrived from Columbia via Greece, through the control of Dutch intermediary. Despite the fact that Pantev gets his hands on only part of the amount, there are rumors he was eventually killed because of that. According to Angelov’s publications, Pantev was murdered as a result of a rift in SIC in which he, together with the Margiun Brothers – Krasimir Marinov and Nikolay Marinov, and Dmitry Minev, aka the Russian (killed in 2004) were pitted against Mladen Mihalev, aka Madzho, and Milcho Bonev, aka Bai Mile (killed in 2004). The rift started over the murder of Emil Petrov, a construction businessman close to Pantev’s wing. Pantev proved to be a hard person to kill. The first attempt on his life was in July 2000 when an assassin with an RPG who shot at Pantev’s armored jeep near his penthouse close to the Sofia zoo; however, the assassin was too close to the target and the shell failed to explode. One of the strongest blasts in Sofia ever happened on November 15, 2000, in the Ambassador Hotel, where a Russian named Alexandr Romanov and an Armenian named Artashes Ovsepyan were blown up as they mishandled a bomb (10-12 kg of TNT) which was supposed to be used to kill Pantev. The end of the brutal criminal boss, however, came on Dutch soil as in February 2001, his girlfriend Petya picked a destination for an exotic Caribbean holiday. Flying via Amsterdam, Pantev and Petya and two friends of their went to the island of Aruba in February 2001. It is there that Pantev – who was without any bodyguards – was shot in the head in a hotel lobby by a man with one accomplice. The two of them disappeared on a motorbike, and were never captured; they entered Aruba with Slovenian passports. Even though some rumors claims that Pantev went to Aruba in order to negotiate with Latin American drug barons, most evidence suggests that he was simply on a vacation, and that the Dutch-governed Caribbean island proved to be an appropriate place for his enemies to eliminate him. In December 2003, a Dutch TV channel reports that a Bulgarian criminal boss is the first ever victim of a gangland murder in the city of Amsterdam carried out in broad daylight. The victim is the man who practically controls Bulgaria’s customs – Konstantin Dimitrov, aka Kosyo Samokovetsa (named after his native town of Samokov) who several years ago had been just a modest bandit. Samokovetsa was born in 1970. In the early 1990s, he was one of the boys hanging out as guards of VIS boss, Vasil Iliev. Rumor has it that one time above-mentioned Poli Pantev in a fit of fury ran into Vasil Iliev’s office chasing Dimitrov because the latter had beaten one of his men. As Iliev protected the young Dimitrov, the whole incident ended with a hearty laugh. Dimitrov’s path crosses many times with that of Pantev, and even though the two formally belong to different groups – VIS and SIC – in the late 1990s Dimitrov becomes a neighbor of Pantev with a penthouse of his own near the Sofia Zoo. Samokovetsa rises to prominence in Bulgaria’s underworld in 1999 when through a scheme with customs officials he manages to take control of the Kapitan Andreevo crossing point on the border with Turkey. He is detected to have had connections with senior officers from the anti-mafia police units – including the top Operational Information Directorate, and even with people from the ruling party at that time – the right-wing Union of Democratic Forces. Gradually, Dimitrov’s people take over all major Bulgarian customs. They collect “customs duties” for him, which actually most firms don’t mind paying because they are smaller than the official state-imposed duties. 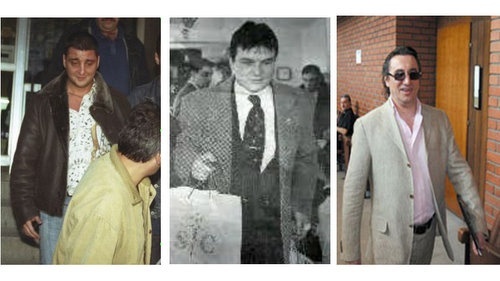 In 2000-2001, Dimitrov’s smuggling revenue was estimated to be about BGN 10 M per month. The only person he is accountable to is Georgi Iliev (aka Zhoro Iliev), who inherits his brother’s empire after Vasil Iliev was killed in 1995. Zhoro Iliev was himself murdered in 2005. Even though some stories claim Dimitrov’s murder was organized by Iliev who started to be concerned about the growing power of the former, in his book investigative journalist Slavi Angelov says – citing sources from the Bulgarian police - that Dimitrov was killed as a result of a fight with some of the bosses of SIC. The incident happened in the Escape disco club in the Studentski Grad Quarter in Sofia in November 2003 when Krasimir Marinov, aka the Big Marguin and Dmitry Minev from SIC insulted a woman that Dimitrov was with at a nearby table. Dimitrov responded by giving them the finger, which within seconds led to a mass fight and shooting involving some 40-50 guards. Samokovetsa is saved by his bodyguards, and flies off to Holland shortly after that. Dimitrov went to the Netherlands rather often. He intended to set up a company there, and even took a course required for that. The Dutch police had been following him at the signals of the Bulgarian police. On December 6, 2003, Dimitrov was killed on the Dam Square in Amsterdam while he was in his car right in front of the Amsterdam Diamond Center, the largest diamond store in the city. He was without bodyguards, and accompanied only by a Bulgarian model, Tsetsi Krasimirova, who suffered a light wound by a ricocheting bullet. The Dutch police captured quickly the physical murderer, a man named Erwin Wrecker, who was sentenced to 15 years in jail. He was detected to have been in contacts with people in Bulgaria connected with SIC. The control over Dimitrov’s business in Bulgaria is split in pieces among other bosses including the Marguin Brothers and Zlatomir Ivanov (aka Zlatko Baretata). During a special police operation on June 20, 2002, a man was arrested on the Vazrazhdane Square in Sofia after making a phone call to Holland. He proved to be Serbian mafia boss Sreten Josic. Josic (born 1962), also known as Joca Amsterdam, reached the top levels of the Serbian mafia in the Netherlands at the beginning of the 1990s. Josic was busted in Sofia over an arrest warrant of the Dutch police who had been wanting him for nine years. It turned out that he had been living in Bulgaria under a fake identity for four years, leaving the country numerous times by using 30 different passports. Shortly after that, Sreten Josic was extradited to the Netherlands for where he served a minor term and was then sent to Serbia four years later. In 2006, a Belgrade court released him on a EUR 300 000 bail. Various rumors claim that Josic organized the murder of Poli Pantev in Aruba (some claim he was hired by SIC for that); he is also said to be connected with the murders of Vasil Iliev in 1995, and of Milcho Bonev, aka Bai Mile – in 2004. One story has it that Bonev was the SIC representative working with Josic and took a large sum of money to help him escape from the arrest in Sofia before his transfer to the Netherlands. Bonev is said to have failed but kept the money, which led Josic to arrange his assassination from the Dutch prison. In 2009, Josic was arrested in Serbia over alleged involvement in the murder of Croatian journalist Ivo Pukanic. This is when he made his claims that in 1998-2002 he was in Bulgaria under the protection of Boyko Borisov (current Bulgarian Prime Minister and Chief Secretary of the Interior Ministry in 2001-2005) and of football club owner Nikolay Gigov. Borisov has responded by saying Josic knew his name and wanted to implicate him in a scandal, and that he was the one who actually was responsible for his arrest. Unconfirmed reports say Josic issued a death sentence for Borisov because of that. The fact of the matter is that two of the most shocking gangland murders of Bulgarian mafia bosses happened on Dutch soil was a coincidence; the two murders happened in places where the killed Bulgarian gangsters felt more secure and were without bodyguards. Both murders happened in the period when Bulgaria saw a peak of gangland killings – late 1990s – early 2000s. The Sreten Josic case also made headlines in that period. It seems that Bulgarian organized crime never really set foot in the Netherlands in any large-scale way. Coincidence or not, however, the two Bulgarian mafia murders on Dutch soil – to the extent that they were noticed by the Dutch public (one of them was certainly noticed by dozens of witnesses on the Dam Square) - hardly contributed positively to the image of Bulgaria in the Netherlands. *This article is based on information provided in "9 Milimeters - The True Story of the Bulgarian Mafia", a book by Slavi Angelov, and on publications in Bulgarian and European media.